If you have a finished basement in your home, it most likely is a space you use and visit frequently. Perhaps your laundry area is down there, or maybe you have bedrooms, playrooms, theater rooms or other living areas below your home. If your basement is finished and you’re down there a good bit, then you most likely will be able to discover and notice basement wall problems pretty quickly. If you live in a home with an unfinished basement, you probably only go down there occasionally. Spotting problems with your basement walls or foundation are less likely to happen in this situation. In addition, unfinished basements often are poorly lit and, therefore, dark. If you have not visited your unfinished basement lately, it’s time to go down there and check it out. If your basement is not well lit, take supplemental lighting with you and inspect your walls for structural problems such as bowing or cracking walls. It would be best if you also looked for drooping or sagging openings on your basement windows and doors. If you’re feeling uncertain about what structural issues you should be looking for, it’s time to enlist the expertise of a foundation repair company such as Anglin’s Foundation & Masonry Repairs. We have a keen eye for spotting harmful structural issues in your home. We offer free inspections of your basement and other foundational structures around your home. After Anglin’s thorough inspection, we will provide you with a free quote to remedy your structural issues that are compromising the integrity and safety of your home. 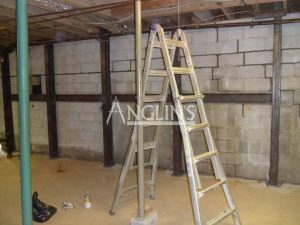 Call Anglin’s Foundation & Masonry Repairs today.